In 2018, central banks added nearly 23 million ounces of gold, up 74% from 2017. This is the highest annual purchase rate increase since 1971, and the second-highest rate in history. Russia was the biggest buyer. And not surprisingly, the lion’s share of gold is flowing into central banks of countries that are in the sights of America’s killing machine—the Military Industrial Complex that Eisenhower warned us about in 1958. The Bank for International Settlements (BIS), located in Basal, Switzerland, is often referred to as the central bankers’ bank. Related to this issue of central bank hoarding of gold is the fact that on March 29 the BIS will permit central banks to count the physical gold it holds (marked to market) as a reserve asset just the same as it allows cash and sovereign debt instruments to be counted. There has been a long-term view that China and other nations dishoarding dollars in favor of gold have been quite happy about western banks trashing the gold price through the synthetic paper markets. But one has to wonder if that might not change, once physical gold is marked to market for the sake of enlarging bank balance sheets. This also raises the question with regard to how much gold the U.S. actually holds as opposed to what it claims to hold. James Sinclair has always argued that the only way the world can overcome the debt that is strangling the global economy is to remonetize gold on the balance sheets of central banks at a price in many thousands of dollars higher. This would mean a major change in the global monetary system away from the dollar, as China has been pushing for the last decade or so. If banks own and possess gold bullion, they can use that asset as equity and thus this will enable them to print more money. It may be no coincidence that as March 29th has been approaching banks around the world have been buying huge amounts of physical gold and taking delivery. For the first time in 50 years, central banks bought over 640 tons of gold bars last year, almost twice as much as in 2017 and the highest level raised since 1971, when President Nixon closed the gold window and forced the world onto a floating rate currency system. But as Chris Powell of GATA noted, that in itself is not news. The move toward making gold equal to cash and bonds was anticipated several years ago. However, what is news is the realization by a major Italian Newspaper, II Sole/24 Ore, that “synthetic gold,” or “paper gold,” has been used to suppress the price of gold, thus enabling countries and their central banks to continue to buy gold and build up their reserves at lower and lower prices as massive amounts of artificially-created “synthetic gold” triggers layer upon layer of artificially lower priced gold as unaware private investors panic out of their positions. “In recent years, but especially in 2018, a jump in the price of gold would have been the normal order of things. On the contrary, gold closed last year with a 7-percent downturn and a negative financial return. How do you explain this? While the central banks raided “real” gold bars behind the scenes, they pushed and coordinated the offer of hundreds of tons of “synthetic gold” on the London and New York exchanges, where 90 percent of the trading of metals takes place. The excess supply of gold derivatives obviously served to knock down the price of gold, forcing investors to liquidate positions to limit large losses accumulated on futures. Thus, the more gold futures prices fell, the more investors sold “synthetic gold,” triggering bearish spirals exploited by central banks to buy physical gold at ever-lower prices”. The only way governments can manage the levels of debt that threaten the financial survival of the Western world is to inflate (debase) their currencies. 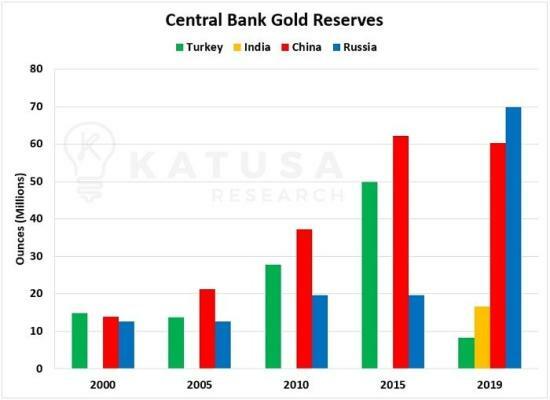 The ability to count gold as a reserve from which banks can create monetary inflation is not only to allow gold to become a reserve on the balance sheet of banks but to have a much, much higher, gold price to build up equity in line with the massive debt in the system. John manages the popular financial website DollarCollapse.com. His books include The Money Bubble: What To Do Before It Pops (2014), The Collapse Of The Dollar And How to Profit From It (2008), Clean Money: Picking Winners In The Green-Tech Boom (2008) and How To Profit From The Coming Real Estate Bust (2003). After earning a Finance MBA from New York University, he spent the 1980s on Wall Street as a Eurodollar trader, equity analyst and junk bond analyst. During the 1990s he was a featured columnist with TheStreet.com and a frequent contributor to Individual Investor, Online Investor, and Consumers Digest, among many other publications. He currently writes for CFA Magazine.